Yesterday Samsung unveiled at MWC in Barcelona, the higly expected Galaxy S5, after a day full of leaks and rumors. After Sony presented the Xperia Z2 in the morning, we finally know all the details of its direct competitor, the Samsung Galaxy S5. Do you want to ROOT your Galaxy S5? Go into our recopilation of rooting methods for Galaxy S5 and enjoy this device rooted. We’re preparing rooting methods for Galaxy S5. Samsung has improved its performance in all aspects, both in the technical specifications and in the features and extra applications available. On the technical side, the Galaxy S5 has a quad-core Snapdragon 801 processor at 2.5 GHz, 2 GB of RAM and 16 or 32GB of internal storage expandable to 128 GB via microSD card. The screen, 5.1-inch, is a FHD Super AMOLED with a resolution of 1920 x 1080 pixels. The device is owered by a 2800 mAh removable battery. The camera has a 16 MP sensor and an improved interface for image acquisition. Samsung claims to have the world’s fastest autofocus (0.3 seconds), and accompany it with a series of improvements for image acquisition, such as High Dynamic Range (HRD), for capturing the natural color in all its intensity, or the Selective Focus, which blurs the background while focusing a selected part of the image. It also offers the posibility to record videos with 4K resolution. The Galaxy S5 is equipped with all kinds of sensors, such as accelerometer, barometer, ambient light sensor, Heart rate sensor or Finger Scanner. It is resistant to dust and water, with IP67 certification. The smartphone runs Android 4.4.2 with the custom Samsung interface Touchwiz, completely renovated over the previous model, and it also includes all the apps offered by company. 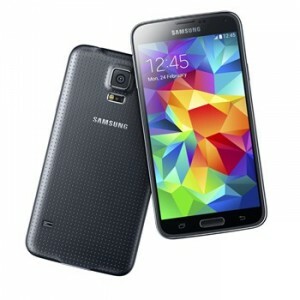 The Samsung Galaxy S5 will be available in White, Black, electric Blue and copper Gold. More information at Samsung Mobile.